In addition to the Quizzes feature we launched this year, we’re bringing our Senior Cycle students another brillaint resource which will should make the way you study much easier. Many students spend hours and hours making flashcards for all their subjects. Which makes sense, as flashcards are a classic study tool and are considered one of the best ways to learn, promoting effective learning through active recall. Flashcards can aid the quick memorisation of quotes, definitions, facts, dates etc; for a number of different subjects. However, many people make the mistake of creating flashcards that aren’t very efficient. It’s important that flashcards don’t contain too much information as this makes them more difficult to read and understand. They must be short and to the point for them to work effectively. 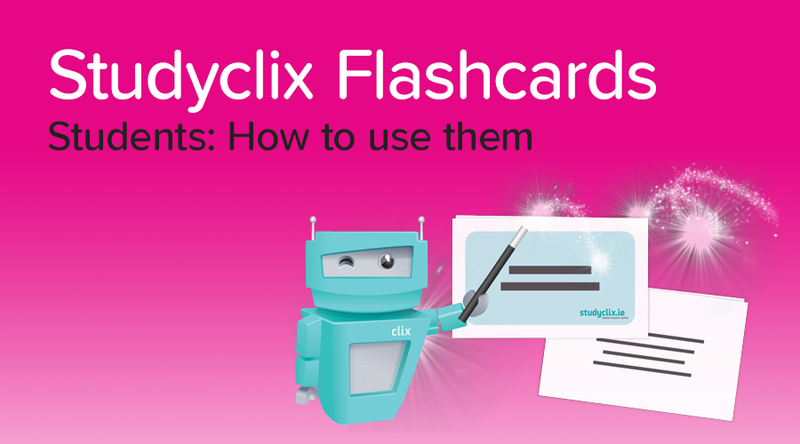 Keep reading to find out how Studyclix's Flashcards can benefit you! We’ve gone and made our own flashcards to help you study, saving you the time and effort involved in making them yourself! Our flashcards are efficient, relevant to exam topics and are a great tool to aid your learning and memorising skills. Our flashcards are made up of important keywords and definitions across a number Leaving Cert subjects (Junior Cert coming soon!). Our team have revised the exam papers from the last 10 years and created a set of flashcards based on the questions asked each year. All you have to do is print them out! How Do Studyclix’s Flashcards Work? 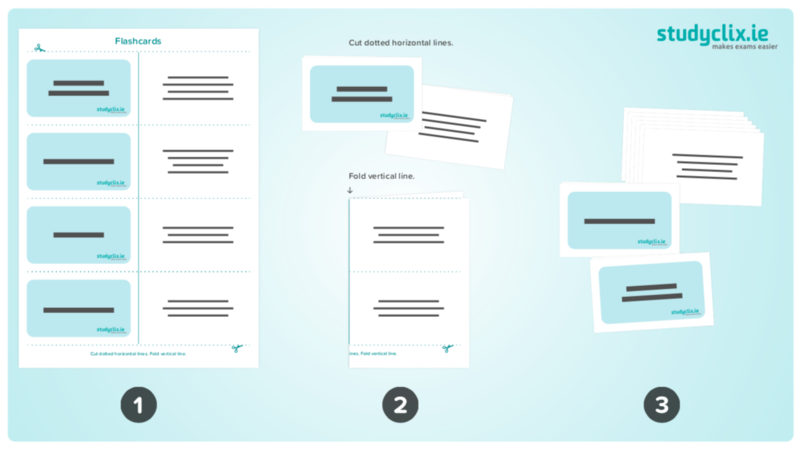 We recommend printing the flashcards on thick card if possible to make them more sturdy. Below is an example of what the flashcards look like. There are 4 flashcards per 1 A4 sheet. Cut the flashcards horizontally and fold them vertically down the middle so that the keyword is on the front and the definition is on the back. When studying our flashcards, we recommend learning in both directions, i.e. recognising the keyword from the definition and vice versa. For example, say one side of a Business flashcard might say “an unplanned decision to purchase a good or service just before a purchase” and from that you can work out that the opposite side will read “Impulse Buy”. By doing this, you establish a strong understanding between both the keyword and definition and you're more likely to recall the answer if you're asked it in an exam. When revising your flashcards, it’s best to create two piles. One pile for the cards you got right and another pile for the cards you couldn’t remember the first time round. This way, you can see what keywords and topics are catching you and you can spend more time working on those until you get them all right. If you're looking for other fun and active methods of studying, check out our Quizzes feature and test yourself to see how much you know on your subjects!